This weekend rained and poured and rained and then continued to rain some more. For well over 36 hours it simply poured rain down (sprung a few leaks in the house too) and I couldn’t have possibly spent a better weekend, curled in a chair under the blankets and with the four men in A Little Life. Jude, Malcolm, Willem and JB filled my entire weekend, I did nothing (outside of laundry) but read this giant tome of a novel. While it’s difficult to fully review this novel and explain to you all that it entails, as you will probably have seen said in the many numbered other reviews, it is an all-consuming read and one I do highly recommend. It is an amazing journey to be taken on – these years/decades in the lives of these four men beginning in college until their advanced middle age – and any ill-at-ease feelings towards the length of the novel (720 pages) can easily be put aside, as once you start reading, it does become quite difficult to stop. I found myself longing to be back at it and I will confess to carrying the book with me everywhere I went – which on this particular weekend was confined completely to my house. It is a roller-coaster of emotions, absolutely but I thoroughly enjoyed this thrilling ride filled with twists, turns, and tears. While reading parts where the severe and sadistic abuse the character Jude was subjected to, makes for some haunting and disturbing reading, it also makes for tremendous reading for how Jude’s life shapes everything and everyone around him. This is really what A Little Life is all about. Jude is the central character, and certainly two of the others in the story, noticeably, Malcolm’s parts, aren’t as prevalent throughout. Yanagihara artfully reveals to the reader how the impact Jude’s past has on Jude himself, and on his three great friends. I will say however, I found there to be repetition in the story surrounding the issues with Jude, and his inability to share or discuss these tortured years before college, with these friends – these three guys that have remained true to him for years and years. Jude is also a cutter – it’s not a spoiler – you’ll find it a significant part of the story. Anyway, he cuts himself as a way of finding release from his tortured past and I will say I found the number of times and the many, many, many years he does this feels at times as though it is highly unrealistic. Yet, outside of removing some of these repeated details which may possibly have shortened the book by about 100-150 pages… this is still quite the astonishing and wonderful read and renders these small complaints of mine as really very minor ones. They certainly do not override the greatness found inside A Little Life. 4.5 stars. Hopefully you can find the time and desire to pick up A Little Life, be forewarned however that you will need to ensure you have large amounts of time to set aside to spend reading. As I mentioned above, once you start, it is extremely difficult to stop. Thank you as well to Netgalley for releasing this title. 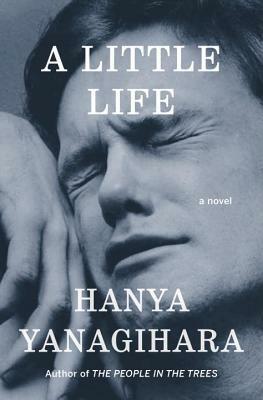 I did start long ago with the electronic version of A Little Life, but something about the e-book wasn’t working for me. I patiently waited for my turn with it in the hardcopy version from the library.